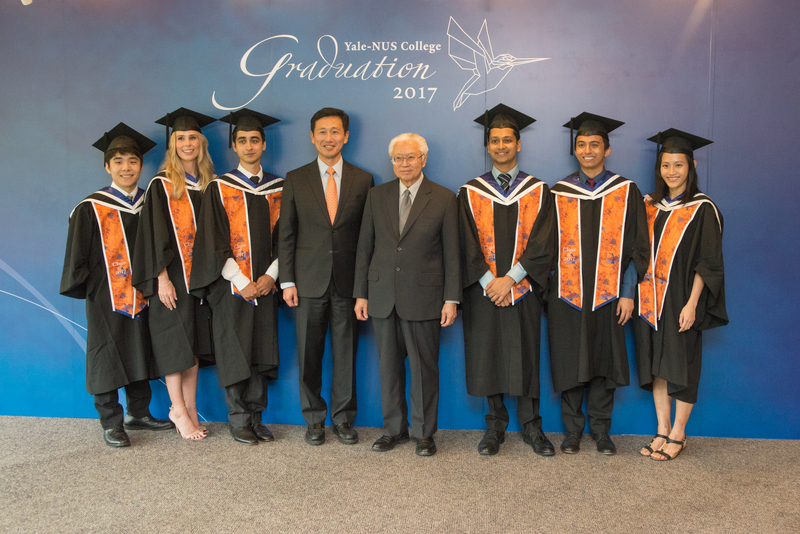 Yale-NUS College held its inaugural graduation ceremony for the class of 2017, on May 29, 2017. The 119 students of the graduating class, down from the 157 admitted, received their certificates from Dr Tony Tan Keng Yam, President of the Republic of Singapore. The ceremony featured guest speakers, as well as speakers from the staff, students and faculty. Of the graduating students, over 60% had secured either a job or a place in higher education at the point of graduating. The graduation speaker was Richard Levin, former President of Yale and Chief Executive of Coursera. In his speech, he discussed recent anti-globalisation sentiments and urged students to push back against them. “The stakes are too high; disengagement is not an option for those like you, who have benefited from the privilege of a superior education,” Mr. Levin said. Another guest speaker at the event was Ong Ye Kung, the Minister for Education (Higher Education and Skills). In his speech, said that every minister of education since the college’s inception had worked to make Yale-NUS a “strategic gem.” He also encouraged students to keep a spirit of adventure and give back to the community. President Richard C Levin speaks at the inaugural graduation ceremony. Attendees were also addressed by members of the Yale-NUS community, including President Pericles Lewis, President Designate Tan Tai Yong, Professor Anju Paul and Anshuman Mohan ’17. As the first speaker, Mr. Lewis began by welcoming everyone to the ceremony. He went on to talk about his pride in the class of 2017 and the responsibilities of the degree, before inviting Dr. Tony Tan to admit the graduates. 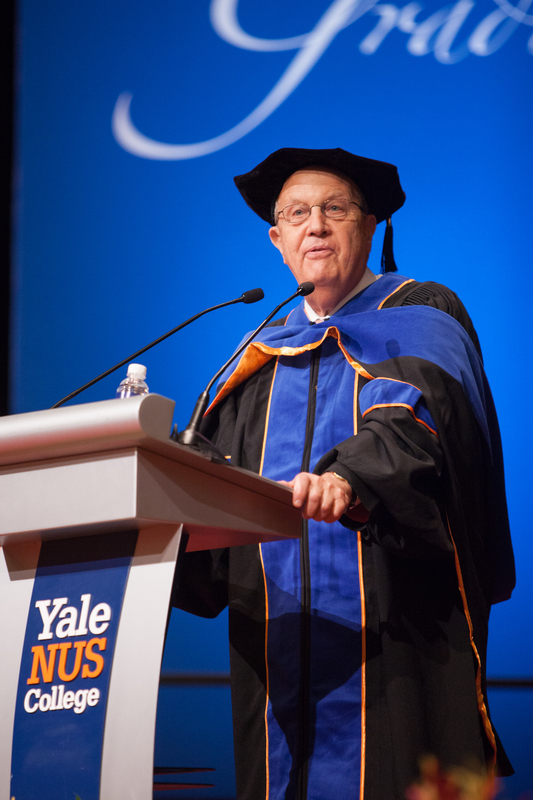 “I hope you will associate your days at Yale- NUS with the responsibility to be of service,” he said. Ms. Paul was nominated by the class of 2017 as the faculty speaker to speak on behalf of the college. In her speech, Ms. Paul said that it was both a terrible and a critical time to graduate and wished the graduates well on their road ahead. 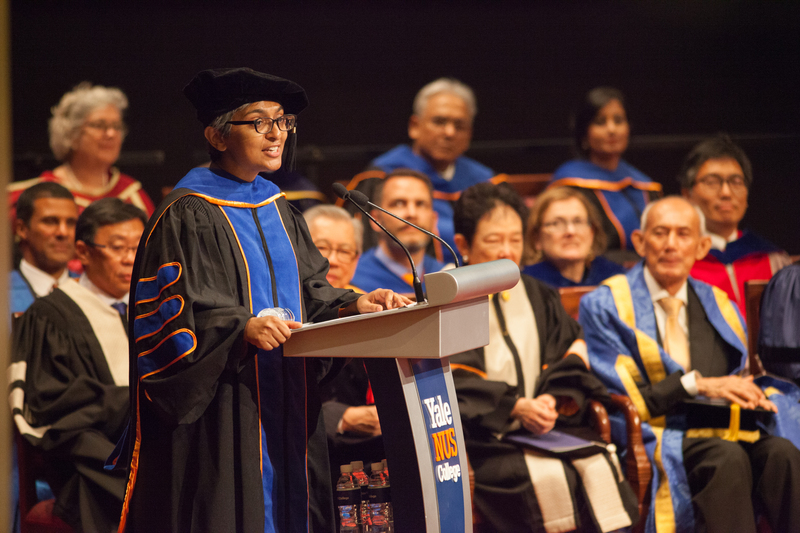 Faculty Speaker, Assistant Professor Anju Mary Paul addresses the inaugural graduation ceremony. Mr. Tan used the event to announce two new gifts to the college. The gifts were the Yale Faculty Visiting Professorship, which was presented by Wong Ngit Liong and Mdm Kay Kuok Oon Kwong, and the Wong Ngit Liong Professorship, which was presented by members of the NUS Board of Trustees and friends of Mr Wong. Mr. Tan said that the former would foster more collaboration with Yale faculty in shaping the Yale-NUS curriculum. Students that received offers of employment are primarily going into the public sector (24%), consulting (24%) and education (18%). Other industries included science and technology, lifestyle and communications. Some students said Yale-NUS’s education was useful in their search for a job. 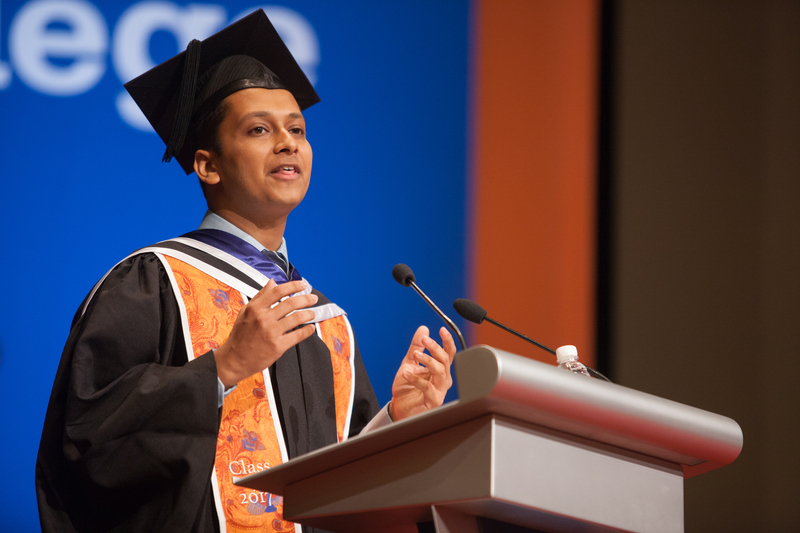 Manas Punhani ’17, who will be working for Oliver Wyman post graduation, said that Yale-NUS had given him “the ability to adapt, be flexible and learn and absorb new ideas and new knowledge quickly.” The sentiments were echoed by Mr Ong Ye Kung in his speech. Similarly, other students praised the ease of switching specialisation for developing specialised skills. Chua Yao Hui ’17, who will be working as a software engineer for Carousell, said he was originally intending to major in economics but switched majors in his third year, which better prepared him for his current employment. A number of students interviewed expressed gratitude for the Class of 2017’s role in shaping Yale-NUS. These sentiments were echoed by Founding President Pericles Lewis who said, in a statement prior to the ceremony, “the intrepid students of the Class of 2017 have chosen to be the trailblazing participants in shaping our community of learning as we seek to redefine liberal arts and science education.” He added that he was immensely proud of their achievements. To mark the occasion, The Octant released a special graduation issue filled with student, staff and faculty contributions.